I believe it’s my Christian duty to pray. This is especially true for me as a priest: one of my most important responsibilities is to pray for the needs of those around me. That doesn’t mean it’s easy or that I’m especially good at remembering who and what to pray for. I often find that the more distant the situation, the harder it is to pray. I’m prone to remember to pray for someone I’ve visited in the hospital or whom I encounter frequently. Still, I try to include more remote prayer requests in my daily intercessions, whether it’s something I’ve read in the news or a request from a parishioner on behalf of a distant relative. There is no shortage of prayer needs, but I am human, and it’s all too easy to let my own needs and quotidian responsibilities drown out might otherwise amount to a robust prayer life. I’d like to think I’m not alone in feeling this way. Most of us probably feel a mixture of sympathy (and saturation) at the constant stream of tragedies happening around the world and in our own neighborhoods. We might be tempted to think that advances in communications technology have made us more aware of suffering in the world and therefore more sensitive to it. But it turns out that we are still human. We are still bound by our physicality, and we are most affected by events that occur within our own communities. Even the most empathetic among us do not grieve at news of a distant tragedy — even a tragedy involving the deaths of numerous people, such as the recent Orlando massacre — the same way we would grieve the death of a close friend or relative. From one angle, this is perfectly normal and acceptable. From another angle, there is something harrowing about the fact that we become numb to all the suffering in the world in order to function. Too much bad news presents itself to us on the 24-hour news cycle for us to process, grieve, and respond as we know we ought to. Landscape with the Fall of Icarus, c. 1555 (oil on canvas) by Bruegel, Pieter the Elder (c.1525-69); Musees Royaux des Beaux-Arts de Belgique, Brussels, Belgium. 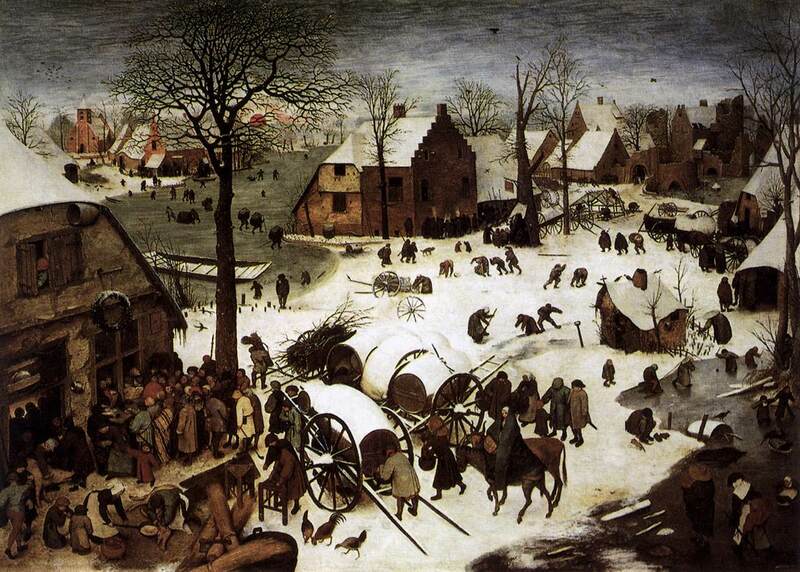 The phrases “miraculous birth” and “dreadful martyrdom” most likely refer to Brueghel’s paintings The Census at Bethlehem and The Massacre of the Innocents, respectively. What these paintings have in common is that their primary subject matter is off-center. What Brueghel — and, by extension, Auden — captures is the notion that the world is largely indifferent to these events, whether they be monumental, tragic, or both. Everyone is going about their business and cannot be bothered to stop and ponder what is occurring before their very eyes. I am hesitant to say more at this point, for fear of diminishing the poem’s power. A good poem cannot be reduced to a single “point” or message. The opposite is true: poetry’s strength is that it can say more with less. Auden offered us a profound meditation on human suffering in 184 words; there are very few people who could say as much in hundreds of pages of prose. I can only offer my reflection, which is to say that Auden has wakened my senses and reminded me of the foolishness of my narcissistic tendencies. I may not be able to solve the world’s problems, but I can pray. Yet I cannot pray unless I am attentive, and attentiveness requires openness to interruptions. I often have “somewhere to get to” and sail “calmly on,” but sometimes a splash in the ocean is not just a splash. Fr. Stewart Clem is a doctoral student in theology at the University of Notre Dame. His other posts may be found here. The featured image is “Prayer” (2006) by Wang Ge. It is licensed under Creative Commons. The Rev. Dr. Stewart Clem is visiting assistant professor of theology at Valparaiso University and assisting priest at St. Paul’s Church (Mishawaka, Indiana). A fellow of the Episcopal Church Foundation, he holds degrees in theology and philosophy from the University of Notre Dame, Duke University, and Oklahoma State University and was ordained to the priesthood in the Diocese of Oklahoma in 2013.